In this mixed bag of a season for the Tampa Bay Lightning, one of the bright spots recently has been Jake Dotchin. The 22-year-old defenseman has 11 NHL games on his resume. 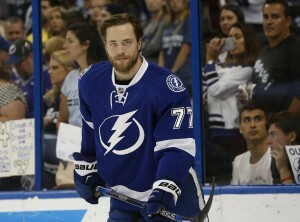 The Tampa faithful has seen his ever-increasing role among the blueliners even line up with All-Star Victor Hedman. Drafted in the sixth round of the 2012 draft, Dotchin helps round out what has turned into a pretty good draft by the team. After the amazing draft of 2011, Lightning GM Steve Yzerman and his scouting team set the bar rather high for themselves. In 2011, the team drafted Nikita Kucherov, Vlad Namestnikov, Ondrej Palat and the recently-traded Nikita Nesterov. All of those players have seen significant playing time over the last four seasons. The organization did almost as well in the following draft. In 2012, the team drafted Slater Koekkoek and Andrei Vasilevskiy in the first round, Dylan Blujus in the second and Cedric Paquette in the fourth. They selected Dotchin in the sixth round, and after two full seasons with the Syracuse Crunch in the AHL, he was brought up to the Lightning in mid-January because of multiple injuries. The scouting reports on Dotchin prior to the 2012 draft were similar: big defenseman who plays a physical game needing to improve his footwork; heavy shot and an ability to get that shot through a maze of players on the net. As scouting reports go, it was pretty generic, but Dotchin does have one thing that cannot be coached: size, and lots of it. At 6 foot 3, Dotchin is a physical presence that must be dealt with by opponents. The kid also seems to like the physical aspects of the game. Why not? With his size, more often than not he is the hitter and not the hittee. Once he was called up by Tampa Bay, most people thought he’d show a glimpse of the future and return to Syracuse once some injuries healed. But Dotchin stayed and played his way to see his minutes go up from 11 in his NHL debut against the Arizona Coyotes. Sunday in Denver, Dotchin saw over 20 minutes in the Lightning’s OT win over the Colorado Avalanche. There isn’t any particular aspect of the game in which Dotchin excels. He keeps his head up and his nose to the proverbial grindstone. As a rookie, Dotchin makes mistakes but they aren’t readily apparent and his heady play far exceeds any errors the kid might make. Granted, his NHL body of work is an extremely small sample size, but his play gave Yzerman enough confidence to trade Nesterov to Montreal in late January. Okay, so maybe it just wasn’t Dotchin’s play that led to that deal, but add the fact that Koekkoek is currently playing in Syracuse. It becomes easier to see the positives in Dotchin’s play. Two defenders who were clearly ahead of Dotchin on the depth chart are not in Tampa right now and Dotchin is playing a whole period’s worth of minutes per game in the NHL with the Lightning. All because Dotchin provides smart, physical and strong defensive play. Again, he isn’t going to wow anyone with anything specific he does on the ice. But when the team needs a big hit laid on the opposing team, there’s Dotchin. When in need of a breakout pass out of the Lightning’s zone, he seems to see the ice very well and makes the tape-to-tape pass to get the rush going. The skill that Dotchin has that is getting him more ice time is his uncanny ability to get his shot through to the net, forcing the goalie to make a play and control the rebound. A right-handed shot, he is now seeing time on the point on the Lightning power play. It’s hard to underestimate that value. In today’s NHL with so much speed, getting a clear shot on net is challenging. Dotchin seems to find that little crevice of space that he needs to get the puck towards the crease. The upside for this kid is intriguing. It is a given that it takes about 300 games for an NHL defenseman to really begin understanding most of what they need to play in the league. For Dotchin, that is going to be somewhere in the 2020-21 season. To see how far he has come in the short time in Tampa is encouraging. He more than held his own with top D-man Hedman. Even though he isn’t spectacular, Dotchin is steady and plays with a confidence that belies his youth and inexperience. The fact that Dotchin has been one of the bright lights in Tampa this season is a double-edged sword. If there weren’t the rash of injuries that led to his call-up, perhaps the team would be a shoo-in for the playoffs. But if those players didn’t get hurt, Dotchin would most likely have spent the entire season in Syracuse. Nesterov and Koekkoek were penciled in to be integral parts of the Lightning defense this season. Dotchin’s name was on the depth chart in Syracuse, not Tampa. That was then and Dotchin is now. With fellow defensemen like Jason Garrison and Braydon Coburn getting longer in the tooth, it’s nice to have a kid like Dotchin. As other D-men like Andrej Sustr struggle in their development, Dotchin is taking advantage of every opportunity. Yzerman has a big job ahead of him as the team continues to flirt with a playoff spot. More Lightning fans are stating emphatically that the team is still mathematically able to make the playoffs, not seeing the writing on the wall that seems to be getting bigger by the day. One player that shouldn’t give Yzerman any issues is Dotchin. He has exceeded the hope of the fans. His increased ice time shows he is at least meeting the coaching staff’s expectations. Dotchin, in his last year of his entry-level contract, will be a restricted free agent in the offseason. Locking him up for the next few years is a no-brainer for Yzerman.